Special features: Lalaloopsy girls character intros; Live-action music video. Janice Roman Roku, Erica Mendez, Stephaine Sheh, Julyza Commodore, Kira Buckland, Cherami Leigh, Rachelle Heger, Cassandra Lee Morris, Christina Vee, Olivia Charles, Karen Strassman, Shelby Lindley. 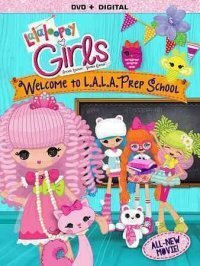 The Lalaloopsy girls are all grown up, and headed for the Lalaloopsy Academy for Learning Arts! The friends discover their new school is super cool, and sew much fun! It's a semester full of laughs and excitement as the girls take creative classes like Glitter 101 and Cloud Sculpting, join silly clubs, make new friends, and cheer on Jewel Sparkles as she runs for student body president! [United States] : Lionsgate, 2014. Description: 1 videodisc (45 min.) : sound, color ; 4 3/4 in.